I think this is seriously awesome. 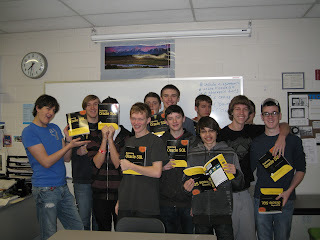 This group of students are using the Beginning Oracle SQL book I co-authored in their high school Oracle class. Yes, that's right. I said high school Oracle class. I just recently became aware that a teacher at this particular Colorado high school has been including Oracle curriculum in her computer science class for a decade or so. Apparently, these kids are using the book to help them prepare for the Oracle SQL certification exam. It amazes me that these high school students are getting exposed to Oracle this early. Not only are they getting exposed but they are learning enough to take (and pass) the Oracle SQL exam. I even heard there have been some students over the years who have completed their DBA certifications as a result of this program. Heck, when I was in high school I had never touched a computer. Of course that was back in the stone age before computers were as prevalent as bottled water (which also wasn't really around when I was a kid)! The fact that this educator has put this in her curriculum and continued to do so for so long is something special. She also takes some of her students to the RMOUG (Rocky Mountain Oracle Users Group) Training Days each year as well. That shows real interest in the kids and a desire to let them see how their education is put into action in the real world. I think such an experience would have had a huge impact on me at that age. So, hats off to this group of students and their teacher. Here's to all of them and the next generation of Oracle professionals! I couldn't resist a comment on this one because it made me smile to think of being in Typing class with you in high school. We had manual typewriters, and it always made me mad that your hands were bigger than mine so you could reach the 'P' and 'Q' keys more easily and therefore could type faster! Imagine how far ahead you would have been if Coach Walker or Beecher Bell had been teaching you Oracle instead??? This post made me think of you and lots of fun memories!!! And I don't think I can force myself to imagine Coach Walker or Beecher Bell teaching me Oracle. It's just too painful for my brain to accept. Ha!